Snoop also decided to throw a BBQ and there we danced the night away, listened to music, and the guys played cards & dominoes. It felt like I was at home on the road... with family and friends. To top it all off, I went to the Dreamworld theme park, which is a combination water park, amusement park and zoo rolled into one. I got to be up close and personal with my DREAM PET, a white tiger! (I hope I can care for one someday) At first I was shaking when I walked into the cage with it, but again my favorite line came to mind: “Be fearless and go for it!” So in order to do this I had to walk behind the tiger, not move too much, and pet its back while we posed together so that the tiger could get comfortable. Voila! I got my tiger moment! Yay! After that, my team and I rode all the major roller coaster rides in the park and I even got my security guard to get on a ride that he was so afraid of. 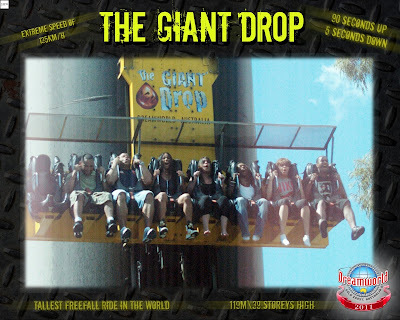 It had the tallest drop in the park at 38 stories high. It was funny seeing him feeling not so secure in the air. He kept saying he's not good with things he can't control. I told him that it was his security “initiation.” He passed the test! After my fun adventure, I winded down my day taking in the sun and laying on a float in the pool while sipping on strawberry mango daiquiris (topped with whipped cream)! Ahhh! I thought it would be fun to share this sweet moment with you all… Hope you enjoy these pics! What do you think about the note and pics?